Have you run into any clowns recently? In his must-read book, Mysterious America, fortean researcher and cryptozoologist Loren Coleman includes a chapter concerning a wave of "Phantom Clown" sightings that occurred during the Spring of 1981. According to news and rumors of the time, children in various areas of the country were being terrorized by people dressed as clowns at playgrounds and school yards. These "clowns" reportedly tried to frighten the children into getting into a mysterious van. These sightings spanned over a thousand miles and covered at least six major cities. No one was arrested, though there was at least one case where there was a police pursuit, and as far as I know there were no successful abductions. I don't think it's that they're clowns, it's that they're people in masks acting suspicious toward other people in disturbing settings. 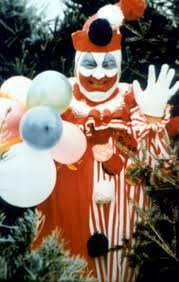 The clown fear is because the human mind dislikes things that look human but are slightly "off." I forget the term for the phobia, not of clowns per se, but fear of off-putting "human looking" faces. The reactions in the video seem a little hokey. It's too on the nose for me. It's a popular thing to be scared of clowns and they're obviously doing it for that reason. I find the whole creepy clown thing amusing, but it's like watching a horror movie you love but aren't afraid of. Yeah, uncanny valley, which sometimes disturbs me, but I guess it's not enough of that to bother me. "How could I possibly author a post that doesn't prominently feature 'me, myself and I'?" Says the guy who's too scared to get his driver's license. Driving is scary though you could lose alot of money or your life. Everyone has fears. I own mine. Having some does not mean I am scared of everything you're not. Seems to be your logic here. I'm not judging anyone for their fears, but me my I'm me and you aren't me or one of mine. What does anything you said have to do with me or myself? How badly did you naturally want to lead right into -yself after you started typing that?